Taken with Olympus E500 digital camera January 19th 2009. Click image for larger view. 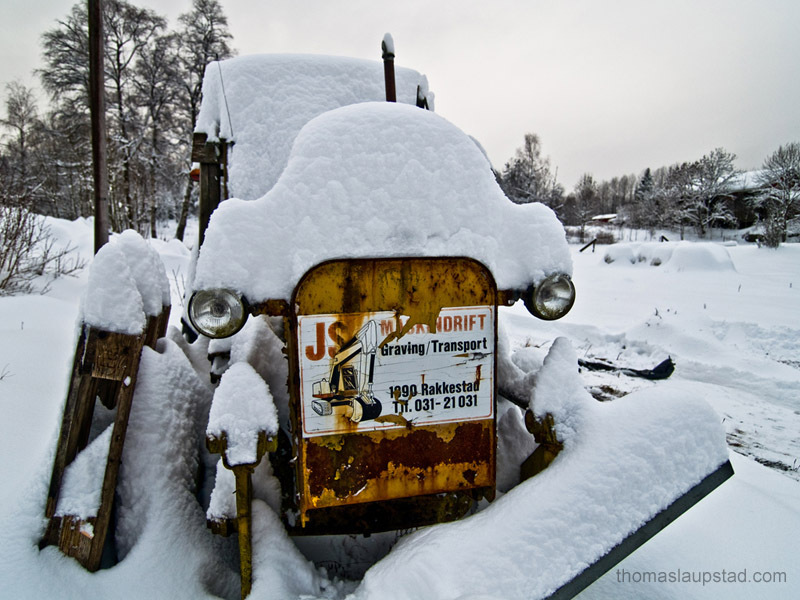 Here I have photographed an old tractor covered with snow. You get some indication of the depth of the snow when you look on the front of the tractor. I played a bit around in Adobe Lightroom with the different adjustments to make the picture a bit more interesting. Advertisement: Have you tried Chitika Premium on your blog? I have been making some extra money from the search engine traffic that I get here on Photos from Northern Norway from Chitika. Always nice to add some cash to my camera equipment budget. Great image! The snow looks so pure and white. Angelic in deed. Wow. It is hard to believe that we live in the same country. I wake up with the rain pounding against the windows while your view looks like a fairytale. Nice contrast between the pure, fresh snow and the rusty machinery. Southern Norway is still way North for many of us… how many hours of light do you get there during the winter? This is an amazing picture! With the snow covering the tractor it offers an almost peaceful feeling to the image and it truly captures the moment. Just beautiful! The snow does look really white there and fluffy. and where is bob the builder? the snow looks so nice. it covers the tractor. i like it so much.